In my personal opinion, Moran has hit the nail on the head here. People spend so long trying to document their adventures in the most fantastic ways possible that deep down they never actually embrace and appreciate the moment they are experiencing. I’ve personally been guilty of this many times; most recently when visiting Machu Picchu. 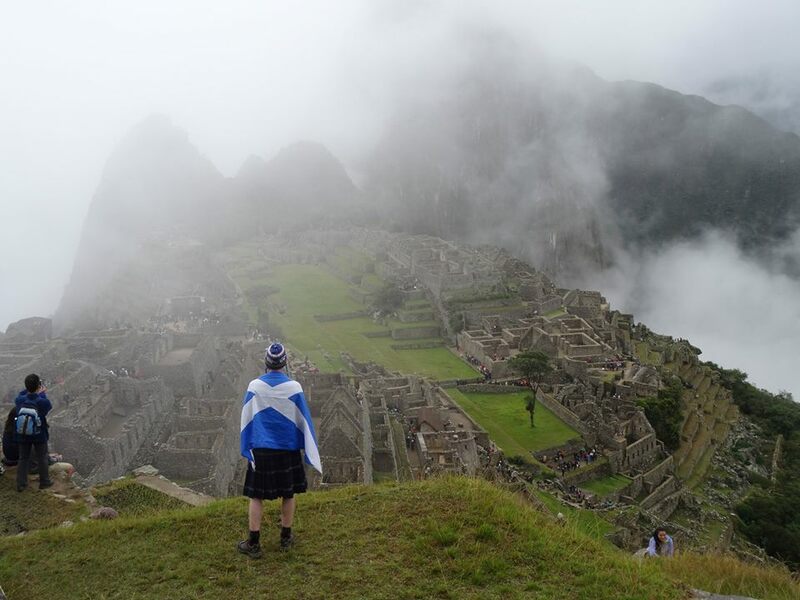 It was wet and overcast when we staggered off the Inca Trail towards the Wonder, only one thing running through our heads: Get that iconic photograph of Machu Picchu in all it’s glory over our right shoulder. And we got it, but at an expense I have only really started to appreciate now. As the temperature warms through the Peruvian morning, rises into the afternoon, the mist and clouds begin to lift. We however were there at 9am, with a bus to catch just before lunch. Visibility was minimal at best, and any chance of a clear photo looked to be shrinking by the minute. Our tour leader Marcelino gave a fantastic guided walk through the Incan ruins, explaining exactly what each carving meant and what each room would have been used for. I would love to share this information with you now, but, alas, I had unknowingly fallen foul of Moran’s philosophical teachings. Writing this post six months down the line, Marcelino’s words are simply a purple haze in my mind; a mind whose attention that day was focused directly on the sky above and the movements of the ominous cumulonimbus blanket floating through it. Yes I captured that proud moment, kilted up and draped in the Saltire flag, but would that day have been even more memorable had I stopped worrying about factors outside of my control and simply listened? I can safely answer Yes! It would have been. Agree with the sentiment. Out of interest, do you think taking pictures is ever worthwhile? And if so, when, and why? Pictures of course have their place and can educate people about cultures and experiences in a way that words cannot. The point I am trying to get across is perhaps one more of self-neediness and the desire for attention. As my good friend Sam pointed out, many photos and ‘selfies’ are snapped solely for self-gratification. People have begun to appreciate photographs for their number of ‘likes’ rather than what the image actually represents, which makes me sad. I suppose it is the intention of the photographer behind the lens that I am addressing rather than the eradication of images. While I would have to agree that some people use the number of ‘Likes’ on a photograph to confirm their experience, i.e. the more ‘Likes’ the better they believe their event to have been, and so on and so forth. Do you not appreciate that pictures are able to recall emotions felt in those particular instances? I’d also like to point out that you yourself have used photographs from time abroad in order to recall memories to assist you documenting your travels particularly well. I’m a consistent follower of your blog. However, I believe my question is, do you not feel you have benefitted greatly from having those images from your travels and in turn would you not feel guilty if you had returned without them? Hi Andrew, I appreciate your support. R.e. my response to Fraser above, it is the motive of the photographer I am addressing rather than the photographs themselves. Many a time have I nostalgically looked back at an individual photo and received floods of memories relating to it. Photos are great triggers in that instance to unlock the mind. What I have an issue with is people that use photos not for this purpose, but for external validation. As you hint towards, photos are very personal items. My recommendation would be to use your camera wisely. Sure, take some snaps to look back on and document your trip, but don’t fall into the trap of letting them conduct the meaning and experience of your trip.